One of my favorite classic fables is that of the Town Mouse and Country Mouse. I grew up a bit of a country mouse, and I love the stillness and open skies of the countryside. There’s nothing quite like waking up before the rest of the world, slapping on a pair of tennis shoes, and going for a solitary walk through the morning mists. But there are certain drawbacks to living in the country. Like getting stuck behind tractors as you drive to school, or not being able to order chinese food delivered to your front door. And now I definitely consider myself to be more of a city mouse. I love the energy and diversity that comes with city living. I enjoy walking everywhere, knowing there are thousands of experiences right at my fingertips. I love being able to order chinese food for delivery. In a medium bowl, whisk together 2 Tbs. sesame oil, 4 Tbs. soy sauce, a splash of hot sauce, and the crushed garlic. Slice the steak and add it to the bowl, tossing until well-coated. Cover the bowl and refrigerate it for 30 minutes to 2 hours. Cook the pasta according to package instructions. Return to pan and toss with 1 Tbs. sesame oil and 1 Tbs. soy sauce. Stir together cornstarch and 2 tsp. water in a small bowl until dissolved. Set aside. Meanwhile, heat a large frying pan over medium-high heat. Add beef and sauté for about three minutes, or until it starts to brown. Remove the beef from the frying pan and set aside. In the same pan, heat the oil over medium heat. Add mushrooms and cook until golden, about four minutes. Add the spinach and sauté until it just starts to wilt, about 1-2 minutes. 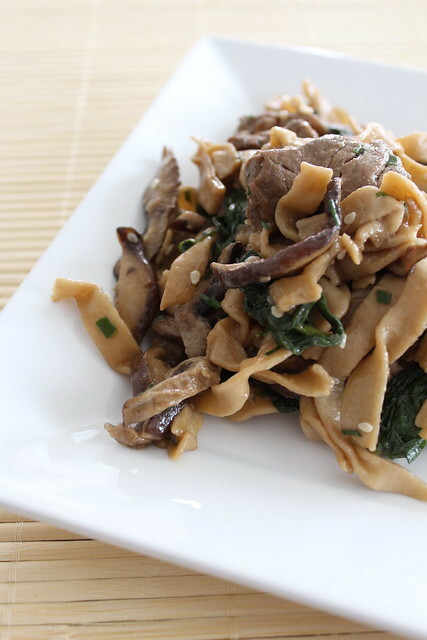 Stir in cornstarch mixture, cooked beef, and noodles. Sauté everything together until hot and well-coated with sauce, about three minutes. Garnish with chives and sesame seeds, and serve hot. Source: Slightly adapted from Clementine Cuisine. Nutrition facts (per serving): 355 calories, 20.2 g fat, 20.6 g carbs, 2.0 g fiber, 24.0 g protein. Alrighty, friends, here’s the final answer for my first composite recipe challenge! So yes, I’m channeling warm weather with a old picnic standby, which was much-needed this week as the snow continued to fall. Nothing lifts my spirits more than sunny egg yolks and bright, tangy dill. Now please excuse me while I go search for spring. Place potatoes in a large pot and cover with water. Add 1 Tbs. salt and bring to a boil. Reduce heat to low and simmer for 10-15 minutes, until slightly tender when pierced with a knife. Drain potatoes and place the colander over the empty pot off the heat. Cover with a clean dish towel and let the potatoes steam for another 20 minutes, until they are tender but still hold their shape. Whisk together mayo, milk, mustard, dill, 1 tsp. salt, and 1 tsp. pepper. When potatoes are cool enough to handle, cut into bite-size pieces. Toss with celery, onion, and egg. Pour the dressing over the potato mixture and gently stir until well-combined. Add more salt and pepper to taste. Refrigerate for several hours to let the flavors mingle. Serve cold. Source: Slightly adapted from Barefoot Contessa at Home by Ina Garten. Nutrition facts (per serving): 215 calories, 21.5 g fat, 1.7 g carbs, 0.3 g fiber, 2.3 g protein. Composite recipe part two! Earlier this week I made mayonnaise from scratch. 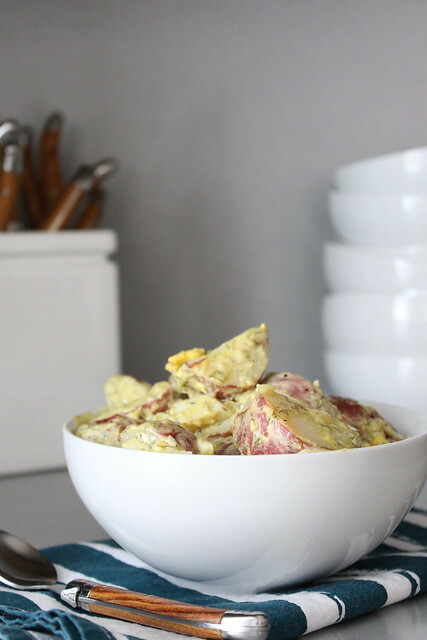 The final recipe guesses included tuna salad, potato salad, egg salad, and deviled eggs. This recipe may or may not rule out some of those guesses. Discuss. 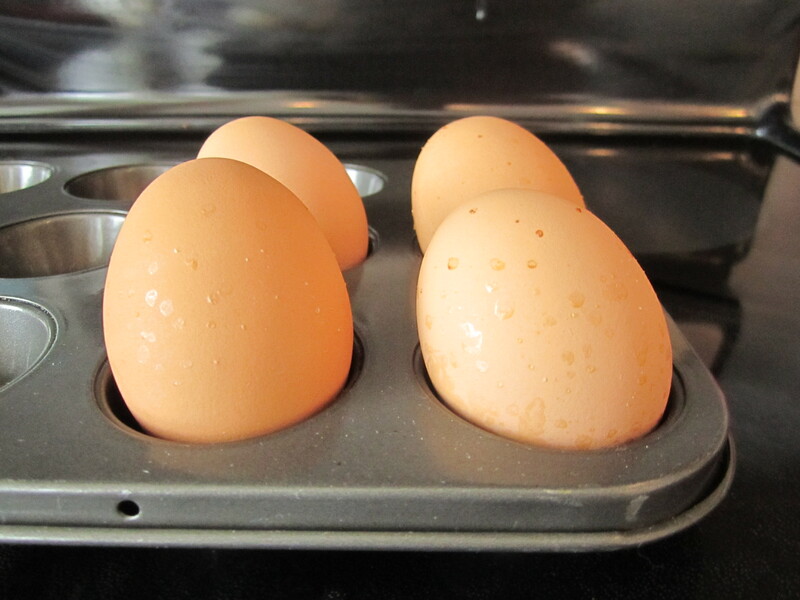 You may get some little brown spots where the egg releases moisture while baking, but those disappear in the ice bath. Sometimes a spot will form where the egg touched the metal pan, but you can remove it with a knife or just shrug and ignore it. Perhaps using a silicone muffin tin would alleviate this problem, but that’s something for another day. 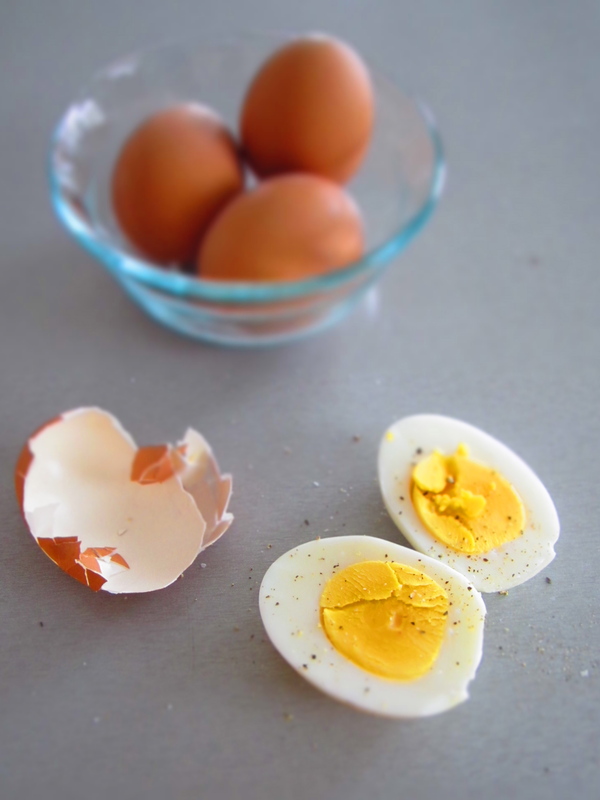 In my opinion, the ease of this method, the resulting texture, and the fool-proof avoidance of gray-green yolks all outweigh a little brown spot or two. So now we have homemade mayo and hard-cooked eggs. Thoughts on the final recipe? Preheat oven to 325° F. Place eggs in a muffin tin and bake for 25 minutes. Remove from oven and carefully transfer to a bowl of ice water. Leave in ice water for 15 minutes, or until cool. Peel immediately and/or refrigerate for later use. Just for fun, I’m starting a new little feature called “composite recipes” on the blog. What’s a composite recipe? It’s what happens when you make a dish using recipe components that are also homemade. Like if I made s’mores using homemade graham crackers and homemade marshmallows. Or tortellini using homemade ricotta and homemade pasta dough. Since I really love the challenge of making as much as possible from scratch, this seems like a perfect recurring feature. All this homemade stuff tickles me pink, but what about you? Well… what if I started posting the recipe components one at a time and then invited you to guess what the final product would be? Your guesses would surely keep me entertained, especially if I start with something as universal as, say, homemade mayonnaise. So many possibilities. So here we go. Part one of this recipe is homemade mayo. Easy peasy. (And no, the final recipe is not a salami sandwich.) What do you think it could be? 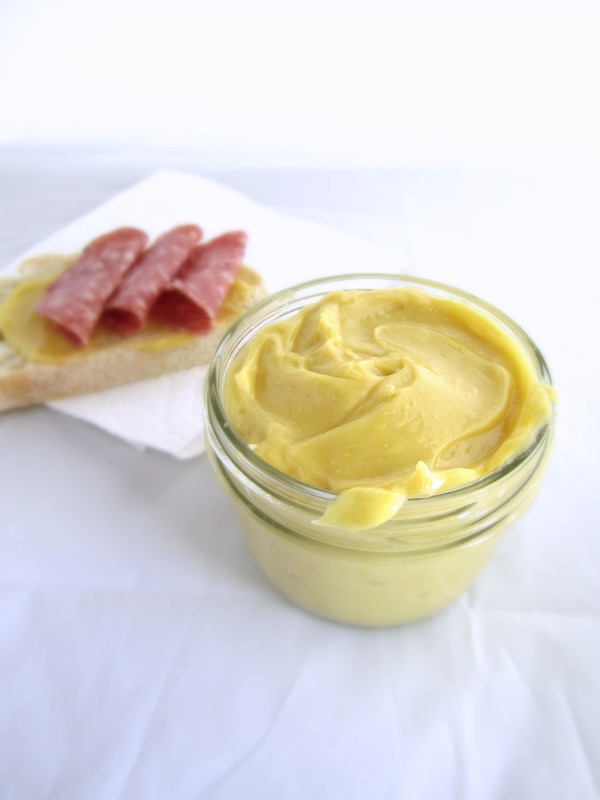 In medium bowl, whisk together yolk and mustard. Slowly begin to add the oil, just drops at first, until the mixture thickens. Add the rest of the oil in a light but steady stream, whisking constantly. * Whisk in vinegar, then salt and pepper to taste. Refrigerate in a tightly covered container for up to 1 week. Makes about 1 cup. Source: “How to Cook Everything” by Mark Bittman. Nutrition facts (per Tbs. ): 125 calories, 13.8 g fat, 0.2 g carbs, 0 g fiber, 0.2 g protein. *You can also do this in a blender or food processor. I found that a stand mixer doesn’t work as well, though, since the whisk attachment has a hard time getting to the bottom of the bowl for the initial mixing.